Healthy Thai Slow-Cooker Ground Turkey Recipe is an easy dinner or meal prep idea! It only takes 10 minutes to prepare, plus it’s gluten-free and dairy-free! 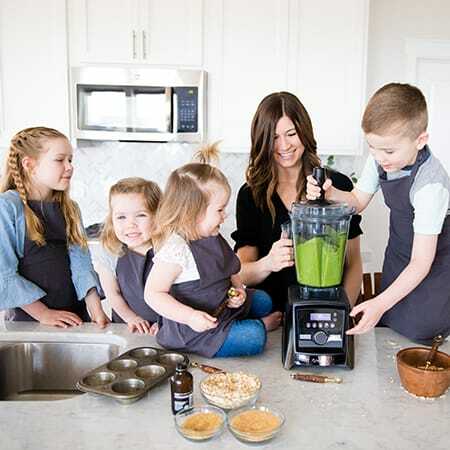 I thought it was important that you know we eat more than breakfast, dessert, and peanut butter in my household! And If I’m not eating chocolate or peanut butter, my next cuisine of choice is Asian food! I love that typical Asian ingredients like hoisin sauce, coconut milk, garlic, ginger etc. are rich in flavor and still healthy! 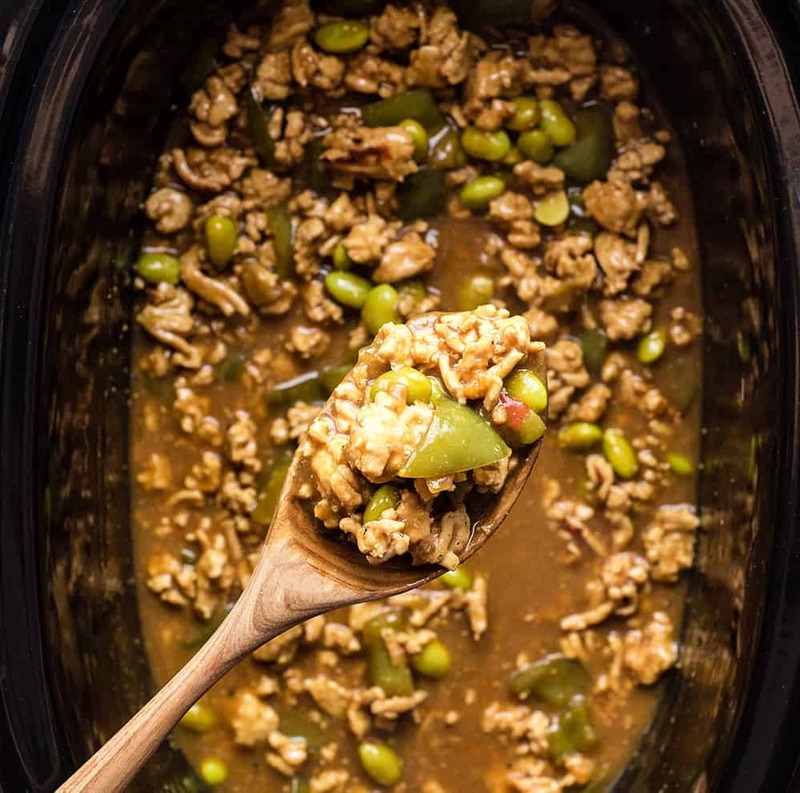 I adore easy healthy crockpot recipes like this Thai Slow-Cooker Ground Turkey! I really couldn’t live without my slow-cooker, especially when it comes to cooking meat! I like my meat to be loaded with flavor, and slow-cooking the turkey in this Thai Slow-Cooker Ground Turkey recipe ensures that it’s thoroughly infused with a Thai coconut flavor that doesn’t disappoint! This Thai Slow-Cooker Ground Turkey is crazy easy to make, but we’ll walk through the process step-by step! Simply whisk the sauce together inside of your slow-cooker and set it aside. 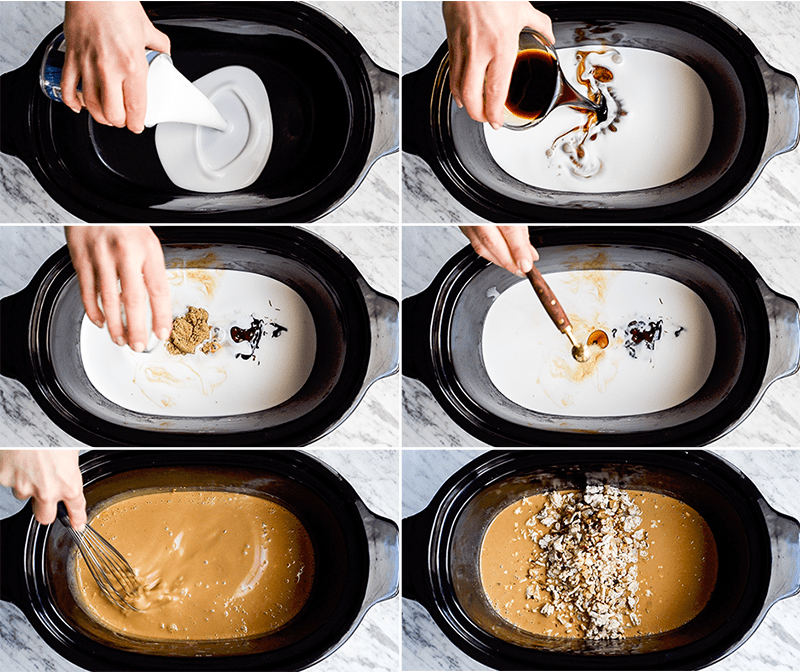 No need to dirty an extra bowl by whisking it in a separate dish! Yay! 2. Brown the ground turkey & onion. 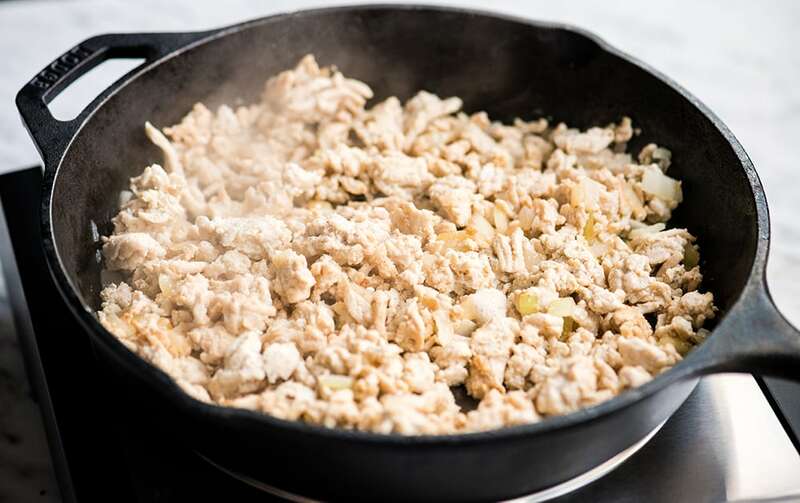 Browning the ground turkey & onion together in some olive oil before adding it to the slow cooker is a key step in making this healthy ground turkey recipe. Browning adds both texture and flavor to this dish! Do you have to brown ground turkey before putting it in the crockpot? Technically the answer is no as long as you cook it long enough. 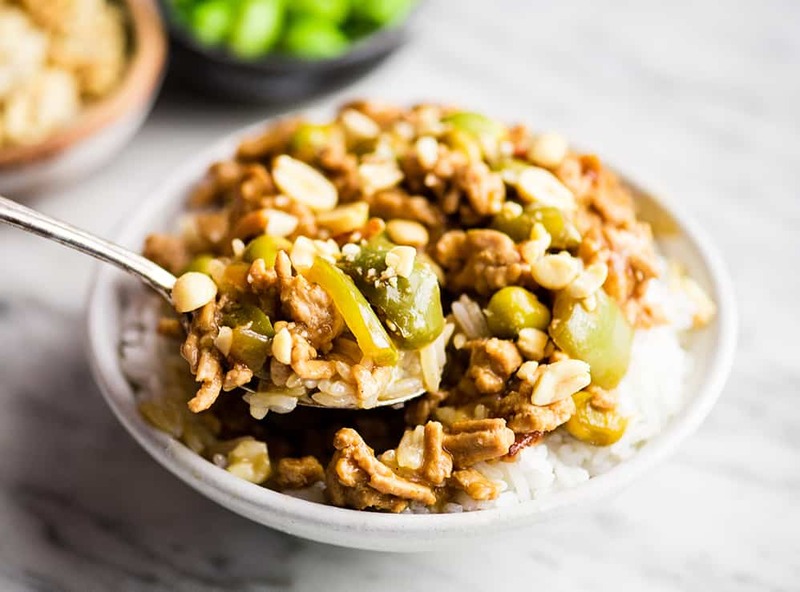 However, I believe browning the ground turkey gives this Thai Slow-Cooker Ground Turkey recipe the best texture and flavor, and I do not recommend skipping this step! 3. Add Turkey mixture & Vegetables to the slow cooker. After the turkey/onion mixture is browned, put it into the slow cooker that was set aside with the sauce inside. Next, add in the veggies of your choice! I use bell peppers and edamame…but really the sky’s the limit (sweet potatoes are delicious too)! Then give everything a good stir! 4. Cook in the slow cooker! Since the turkey in this Thai Slow-Cooker Ground Turkey recipe has already been cooked, this dish only needs to be cooked until the veggies are done. I recommend cooking it on high for at least 2 hours, or on low for at least 4 to give the flavors time to blend together. This is one of the reasons I adore this healthy ground turkey recipe. I don’t have to start it in the crockpot in the wee hours of the morning to still have a delicious dinner prepared for my family! If I forget to start it until nap time, I still have plenty of time left to get it in the slow cooker (and take a nap myself)! If necessary, use cornstarch (or tapioca starch) and water to thicken the sauce in the crockpot. I find that I don’t always have to do this step, and that it depends on the water content on the vegetables I choose to use! Cook for 30-60 minutes on high or until sauce is thick! After adding the cornstarch and water to the Thai Slow-Cooker Ground Turkey, leave the top slightly ajar and cook for 30-60 minutes, or until it is thickened to your liking! 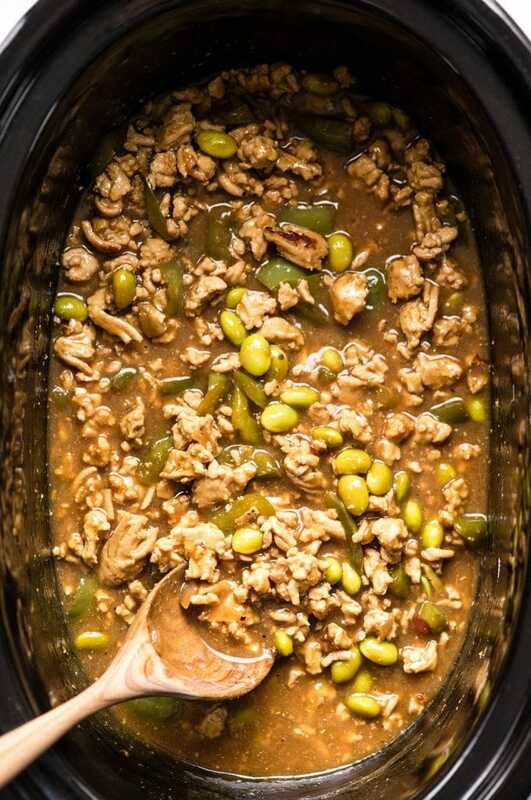 Serving Suggestions for this Thai Slow-Cooker Ground Turkey recipe! Here are a few delicious ways to serve this Thai Slow-Cooker Ground Turkey (other than all by itself, of course! 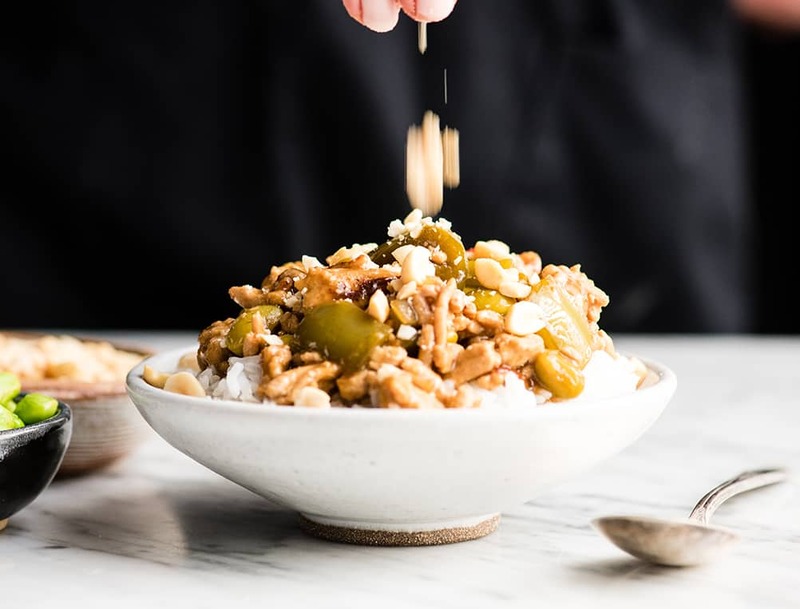 I always serve it with crushed peanuts or cashews sprinkled on top! YUM! Serve it over Noodles or vegetable noddles of your choice (zucchini, sweet potato, etc). Here are some commonly asked questions about this Thai Slow-Cooker Ground Turkey recipe! Can you put raw (or frozen) ground turkey into a crockpot? Yes you can! If you’d prefer to skip the browning step (however much I don’t recommend doing that), you can add raw or frozen ground turkey to the crockpot. However, I’d recommend modifying the method a bit if you do this…. Cook the ground turkey alone in the sauce for at least 3-5 hours (on low or high), until it is cooked. You may need to skim fat off the top of the sauce or break up the meat during this process so it doesn’t end up in clumps. Add the vegetables after the meat is cooked and continue on with the recipe. 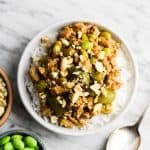 How can I make this Thai Slow-Cooker Ground Turkey Gluten-Free? 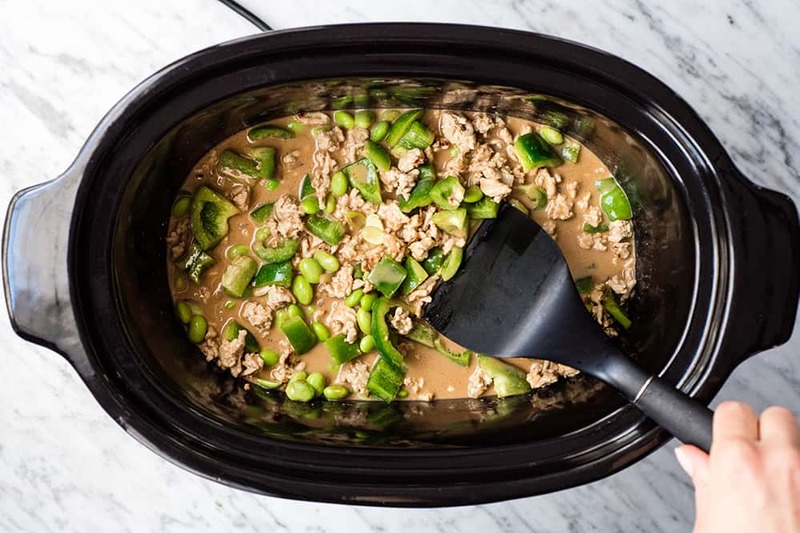 Can I freeze this Thai Slow-Cooker Ground Turkey? Yes! You can easily put it in a freezer-safe container and freeze for up to two months! How do you store Slow-Cooker Ground Turkey? 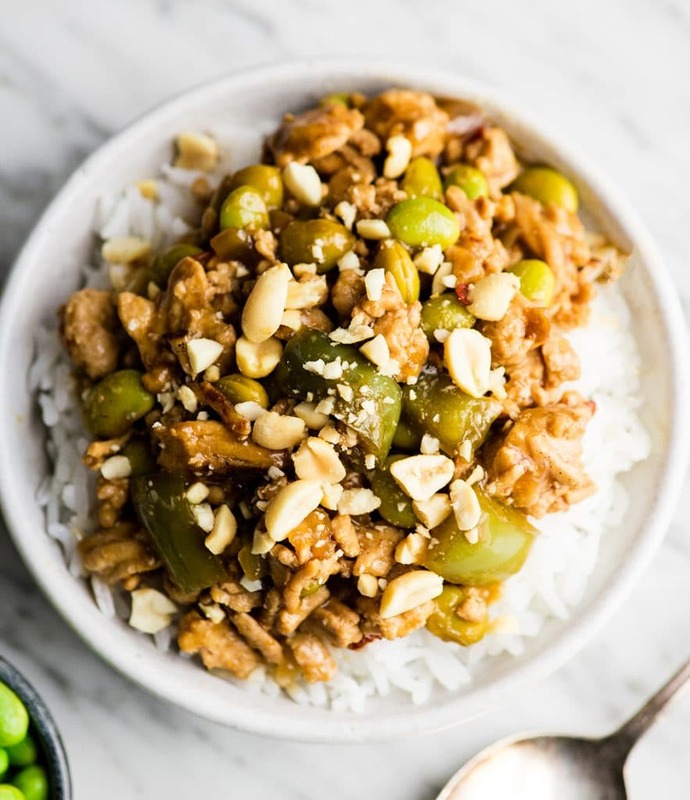 Store this Thai Slow-Cooker Ground Turkey in an airtight container in the refrigerator for up to 6 days! It’s a great meal prep idea to make on a Sunday and enjoy all week long! Here are a few potential substituions for this healthy slow cooker turkey recipe! Ground turkey. 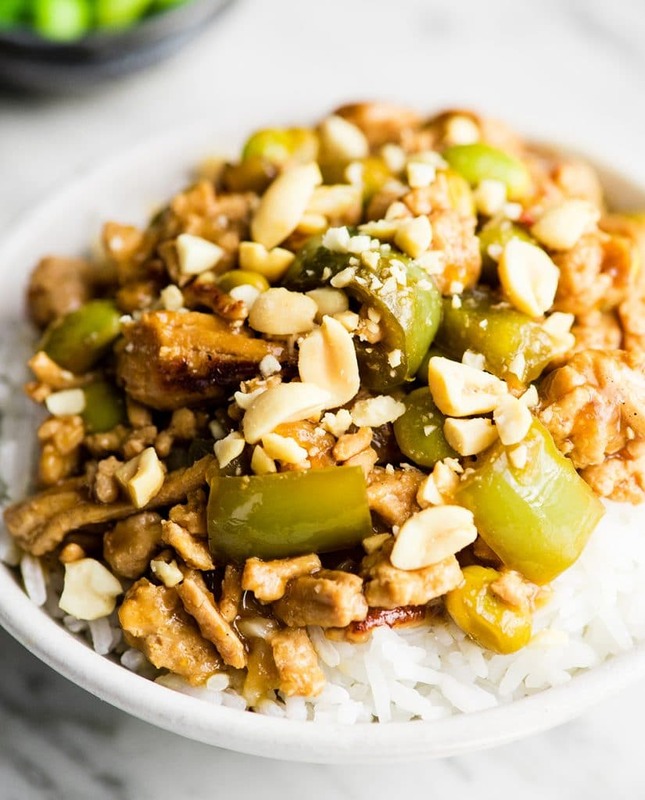 Ground chicken or beef work well in this recipe too! Soy sauce. For a paleo version use coconut aminos. Brown sugar. Any granulated sugar works well in this recipe! Use coconut sugar for a healthier option! Honey also works really well! Powdered garlic. Fresh minced garlic can be substituted for powdered. Powdered ginger. Fresh minced ginger can be substituted for ginger powder. Bell Peppers & Edamame. use any of your favorite vegetables of choice! Sometimes I even put sweet potatoes in the dish! Cornstarch. Arrowroot or tapioca starch work perfectly in this recipe too! Add coconut milk, soy sauce, hoisin sauce, brown sugar, chili sauce, sesame oil, powdered ginger & garlic powder to your slow cooker. Whisk together until smooth. Set slow cooker off to the side. In a large skillet, heat 1 TBS olive oil. Add ground turkey and onion and cook until turkey is browned on all sides (about 10 minutes). Add the turkey/onion mixture to the crock pot and stir until it's evenly distributed in the sauce. Add diced bell peppers (or any color of your choosing) and edamame to the crockpot and stir until everything is evenly distributed. Cook on high for at least 2 hours, or low for at least 4 hours, until the veggies are cooked to your liking. To thicken the sauce: Mix together cornstarch and water, add to crock pot and cook on high for 30-60 minutes, with the lid slightly ajar. Once veggies are cooked to your liking and sauce is thick, serve over rice or noodles! This post was originally publish on May 26, 2016. It has been updated with new photos, a video and detailed instructions, but the recipe remains unchanged. Yay! Hopefully it complies with your new lifestyle! 😉 I never can figure out what to call it! I think it’s like tissues…they are tissues but since Kleenex was such a popular brand they became kleenexes. I think slow cooker might be the original and crock pot the brand?! Who knows! LOL! I have to try this, the combination of coconut milk and hoisin sauce sounds devine. Finding turkey in South Africa might be a problem though, lol!! Hey Michelle! You could absolutely sub ground chicken or ground beef if you can’t find ground turkey! 🙂 Hoisin sauce is on my list of top 5 favorite condiments!!! 🙂 And you can never go wrong with coconut milk! This looks AMAZING! I am always looking for new ways to use ground turkey so this looks perfect! Your recipe for Slow Cooker Thai Coconut Ground Turkey would be delicious! Thanks so much for sharing with Full Plate Thursday and have a great weekend! I felt like I was in a dinner rut and just did not know what to cook, until I realized that I had pretty much all the ingredients to make this! So I tried it out for friends that came over for dinner and everyone enjoyed it. We had it with rice. The edamame was such a wonderful component, I wouldn’t leave it out! Very tasty and nutritious. I highly recommend it. Easy recipe that you just can’t screw up. Thanks!! Loved this! I put this in the pan first time making it and it turned out just as delicious in ~20 minutes. Easy to substitute things, i.e. pork in place of turkey, sambal in place of sweet chili sauce, et cetera. I’m so glad you enjoyed it Hannah! Mmmm this looks so yummy! I”m so glad you republished this; I’m bookmarking and HOPING to make it soon. 🙂 We love Asian cuisine in our house. You and your family will love it Emily! Another hit with my family! Really tasty and easy…I have been experimenting with adding different veggies depending on what I have on had. This recipe is a keeper, thank you! I’m so glad you love this dish Amy!! !